U.S. foreign policy in Southeast Asia in light of President-Elect Donald Trump’s administration is drifting off to sea placing the U.S. in a precarious position of isolationism in a region where China and Russia have been aggressively building alliances and partnerships. Amidst shifting global relationships and allegiances this is not a time for the U.S. to adopt a foreign policy built on isolationism or non-involvement but, rather it is a time to accelerate Southeast Asia foreign policy initiatives. The tipping point for U.S. allies in Southeast Asia was and is Mr. Trump’s repeated statements that his administration would not support the U.S. joining The Trans-Pacific Partnership (TPP), also known as the Trans Pacific Partnership Agreement (TPPA). If ratified, the TPP would be a comprehensive trade agreement among twelve Pacific Rim countries: Brunei, Chile, New Zealand, Singapore, Australia, Canada, Japan, Malaysia, Mexico, Peru, the U.S., and Vietnam, representing nearly 40 percent of global GDP and a third of world trade. This has dampened the strength of U.S.’ Southeast Asian foreign relations; weakening ties in Malaysia, the Philippines and Thailand. Mr. Trump should well know that cordial foreign relations always follows the money. Ratification of the TPP must occur by February 2017 by at least six countries accounting for 85 percent of the entire group’s combined gross domestic product. Unfortunately, this is impossible without a commitment by both the U.S. and Japan. As it stands now, Mr. Trump is unlikely to send the TPP agreement to Congress for confirmation. Without the TPP, the People’s Republic of China’s Regional Comprehensive Economic Partnership (RCEP) initiatives will gain momentum. If realized, the RCEP would account for 40 percent of global trade and cover three billion people regionally, making it the world’s largest trading block, ahead of even the European Union. Seven nations have engaged in both TPP and RCEP negotiations: Australia, Brunei, Japan, Malaysia, New Zealand, Singapore and Vietnam. The U.S., Canada, Chile, Mexico and Peru are TPP-only negotiators. The RCEP-only countries, other than China, are Cambodia, India, Indonesia, Laos, Myanmar, Philippines, South Korea and Thailand. What distinguishes the TPP from the RCEP is that the TPP protects and promotes Rule of Law by requiring member nations to liberalize their economies, and to protect labor rights, the environment, intellectual property, and foreign investments. Participating in the TPP is a form of soft power and it has been a driving factor in previous presidential administrations to promote democratic values in other countries. With the simmering South China Sea dispute, the use of soft power in Southeast Asia has never been more important. China seeks to complete a “strategic triangle” in the SCS to monitor and control regional maritime activities, to bolster its naval position, and to gain access to much-needed oil and natural gas using advanced deep sea drilling technologies. 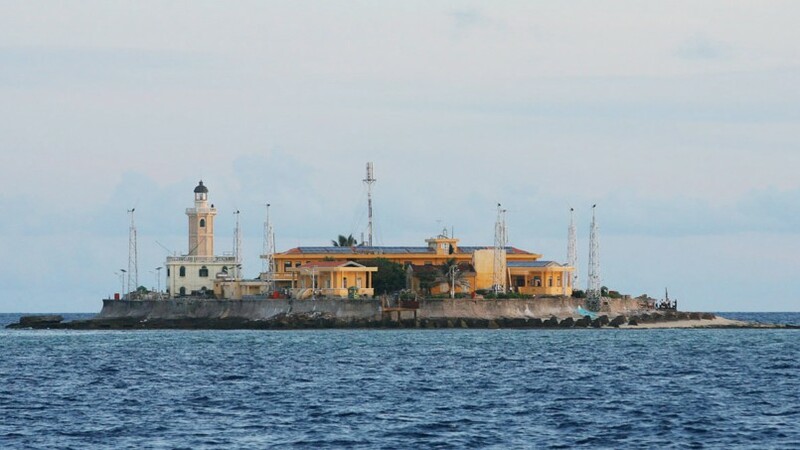 China has constructed 3,200 acres of man-made islands on reefs, increasing its EEZs by 200 nautical miles or 370 km, and its territorial seas by 12 nautical miles or 22 km, on which it has installed airfields, surveillance systems, and a radar tower. China plans on installing an Air Defense Identification Zone, or ADIZ, covering the SCS. An ADIZ demarcates a zone outside a country’s national airspace in which aircraft must identify themselves and follow the country’s military instructions. China’s expansionist and illegal actions in the SCS have been protested by numerous SCS claimants, including Malaysia, Vietnam, Brunei, Taiwan, Indonesia, and the Philippines, who are supported by the U.S., ASEAN, Australia, Japan and France. The 2002 Declaration on the Conduct of Parties in the South China Sea (DOC), in which ASEAN and China agreed upon multilateral risk-reduction and confidence-building measures, requires that territorial and jurisdictional disputes be resolved without resorting to the threat or use of force. Less than six months ago, a July 12, 2012 decision by the Permanent Court of Arbitration’s (PCA) issued an action brought by the Philippines to protect its rights in the SCS. 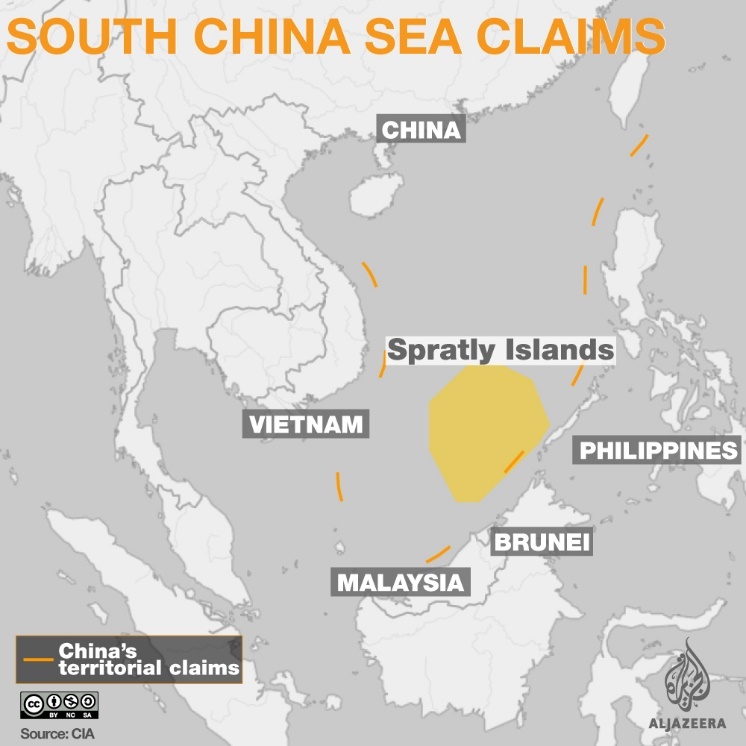 The PCA opined that China violated the United Nations Convention on the Law of the Sea; an agreement about territorial seas and exclusive economic zones (EEZ), in claiming sovereignty over the 95% of the SCS, known as the “nine-dash line”. Before the decision was even rendered, China stated that it would continue on its expansionist path. On September 8, 2016, the 10 Association of Southeast Asian Nations (ASEAN) heads of state, the leaders of Russia, India, Japan, South Korea, Australia and New Zealand, together with President Barack Obama and Chinese Premier Li Keqiang “…reaffirmed the importance of maintaining peace, stability, security and freedom of navigation in and over-flight in the South China Sea”. China remained committed to its course of action. The direction ASEAN takes at the 2017 Summit will be under the control of controversial Philippine President Rodrigo Duterte, the 2017 Chairperson. “The chair of ASEAN has the power to set the agenda. What [the chair] has been used for historically is to cut things out of the agenda, particularly the South China Sea. And it will be very interesting to see whether the Duterte Administration puts it on the agenda, and I think it will open the door to other claimants to voice their thing,” explained Tim Johnston, Asia program director for International Crisis Group. The direction to be taken by Mr. Duterte will impact all SCS claimants and, as of right now, Mr. Duterte cannot be expected to promote Rule of Law having relinquished the Philippines’ SCS claim. The first rule of economics is no such thing as a free lunch. On December 19th, concurrent with Mr. Duterte’s announcement, China offered the Philippines $14.4 million worth of military assistance, without the conditions traditionally attached to U.S. The relationship between the Philippines and the U.S. rapidly disintegrated after the 2016 election of Mr. Duterte as President. Mr. Duterte’s anti-drug crusade involving widespread and seemingly indiscriminate extra-judicial killings constitute egregious human rights violations under international law. Mr. Duterte’s policies initially precipitated a refusal by the U.S. to continue selling the Philippine assault rifles. By mid-December Washington halted all aid based on “…significant concerns around the rule of law and civil liberties in the Philippines.” In 2016, the U.S. provided the Philippines with over $120 million in military aid, a $50 million increase over 2015, and an additional $42 million coming from the Southeast Asia Maritime Security Initiative. Despite more than a century of U.S.-Philippine military cooperation, this was followed by a statement that the Philippine’s government was scaling back on routine joint military exercises with the U.S. and that the Philippines would no longer host U.S. military ships patrolling the SCS. Legally, under the April 28, 2014 Enhanced Defense Cooperation Agreement (EDCA), the U.S. patrols the SCS to protect the Philippines’ EEZ. Under the EDCA, the U.S. also rotate troops in the Philippines; builds and operates temporary facilities on Philippine’s bases, for both American and Philippine forces; and gives giving Philippine’s personnel access to American ships and planes. Under the U.S. and Philippines 1951 Mutual Defense Treaty, the U.S. is be obligated to come to the defence of the Philippines if it is attacked by any foreign power. Thereafter, Mr. Duterte has vacillated between the U.S., China and Russia. Damage control quickly followed. On November 30th Philippine’s Foreign Affairs Secretary Perfecto Yasay Jr. refuted rumors that Mr. Duterte’s upcoming visit to Russia was to establish a military relationship. Mr. Yasay stated that the focus was on defense cooperation limited to sharing information on terrorism, drugs and enforcement. 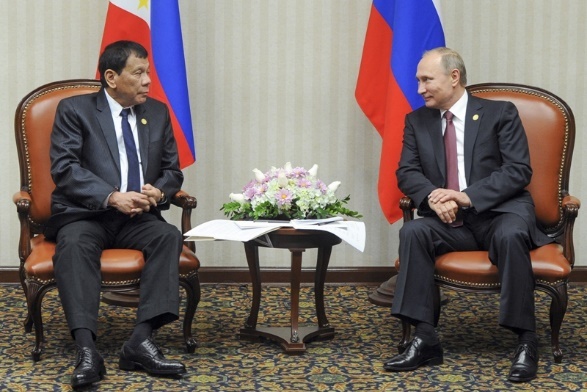 It is questionable what information Mr. Duterte plans on sharing with Russia, given that under the EDCA, Philippine’s military personnel have access to U.S. military weapons and equipment and, therefore, the underlying technology. At this time, the direction Mr. Duterte takes at the 2017 ASEAN summit is anybody’s guess. Understanding that the TPP could help stabilize Southeast Asia, Japanese Prime Minister Abe Shinzo was the first foreign minister to meet with Mr. Trump post-election. Even if the Trump administration pushes Japan to join RCEP, the long-standing U.S. and Japanese military alliance is not for sale. 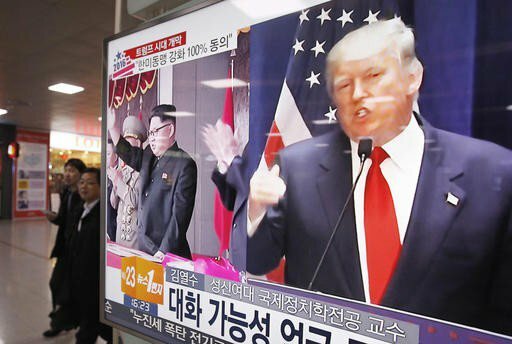 Both countries have united to respond to provocation by the erratic North Korean demagogue Kim Jong-un and an increasingly militaristic and aggressive China. Fearing further regional destabilization, in late December Mr. Abe approved a record defence budget, including five new large patrol ships, 200 additional maritime law enforcement staff, and a ballistic missile defence system upgrade. The increase came as China’s Liaoning aircraft carrier traversed through Japan’s Ryukyu island chain and the East China Sea to the SCS where neared Taiwan, fueling tensions not only in Japan but also Taiwan. 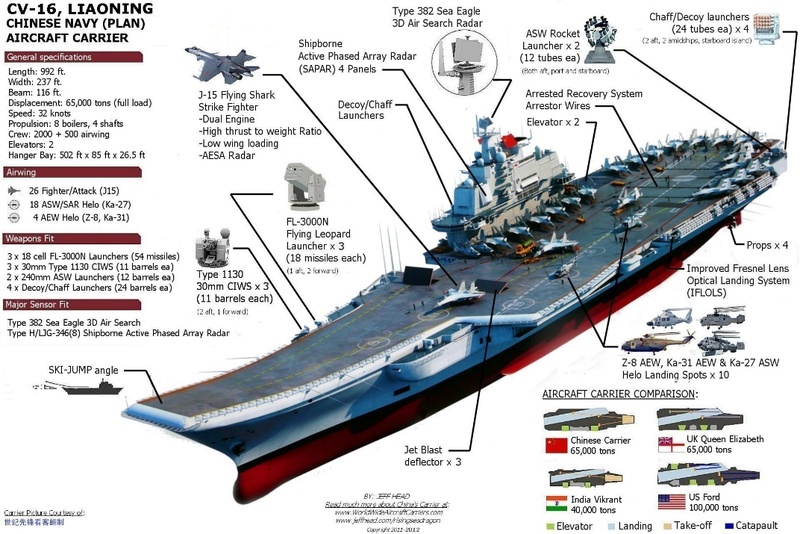 According to the Japanese defence ministry the Liaoning is one of a fleet of eight Chinese warships including destroyers and frigates. The Liaoning’s passage near Taiwan can be attributed to Mr. Trump foreign policy naiveté. His first major faux pas was recognizing Taiwan in a matter deemed by China to violate the “One-China” policy. The “One-China” policy is accepted by the United Nations, which has denied Taiwan member state status for the reason that it is not a sovereign nation but rather falls under Chinese sovereignty. As a United Nations member nation, the U.S. to bound to the “One China” policy. That conversation precipitated a Chinese navy ship intercepting and seizing a U.S. naval drone legally deployed from an unarmed naval research ship in international waters for ocean exploration under the guise that it was interfering with other craft. The real reason for seizing the drone was for Beijing to send a militaristic message to Washington that Mr. Trump has angered China. Tensions with China were further exacerbated following Mr. Trump’s appointment of Peter Navarro to lead a new presidential office for US trade and industrial policy. Mr. Navarro has published two books that are sharply critical of China; in the first, Mr. Navarro predicts that war between China and the U.S. is inevitable. Mr. Navarro recently stated that, “For more than two decades, I have been telling people that the first thing China would do before trying to take Taiwan would be to take the Spratly Islands. If the world simply ignored that, then Taiwan would be next,” no doubt influencing Mr. Trump’s decision to speak with Taiwanese President Tsai Ing-wen. Many of Mr. Navarro’s other beliefs, assimilated by Mr. Trump, have been proved faulty. George Tenet, former CIA director, astutely described the foreign policy reality that for every action “there is an unequal and opposite over-reaction,” a concept Mr. Trump has not yet mastered. Mr. Trump must learn the ‘diplomatic dance’ of maintaining cordial relationships China, and the seduction of soft and hard power China has successfully used in courting many of U.S. allies, indispensable if America intends upon remaining a superpower. 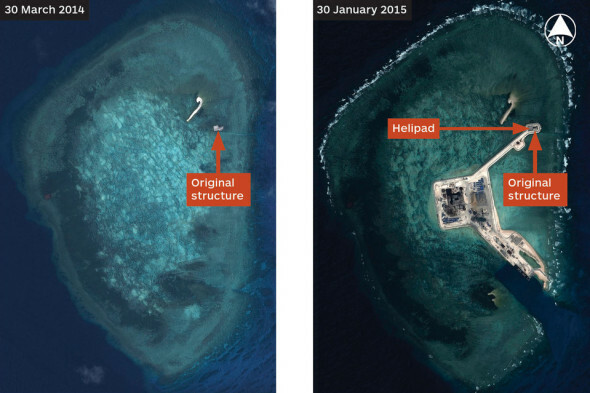 Not willing to concede its SCS claim to Beijing, Vietnam has made vast improvements to its air force capabilities on Spratly Island. After adding 57 acres or 23 hectares of land to Spratly Island, it doubled the single runway to 1,200 meters or 4,000 feet, and doubled the number of aircraft hangars to four, creating a base for maritime surveillance aircraft, transport planes, and combat aircraft. Vietnam fortified several islands with mobile rocket launchers capable of striking Chinese military installations in the SCS. During a June 1, 2016 visit by Mr. Obama to Hanoi, he not only promoted the TPP but, announced that the lifting of a decades old arms embargo, new commercial agreements worth more than $16 billion, and the posting of Peace Corps volunteers to Vietnam. Mr. Obama successfully requested U.S. access to Vietnam’s sheltered deep-water Cam Ranh Bay military port. As for continued defense support there has been no comment by the incoming administration which is predicted to maintain its current position on the SCS dispute. Thailand separates the Strait of Malacca from the SCS through which one-third of global trade and two-thirds of all oil and liquefied natural gas pass making it extremely important to Western countries trading with Southeast Asia and conducting Freedom of Navigation patrols. Thailand has remained neutral in the SCS dispute. After Thai Prime Minister General Prayut Chan-o-cha seized power in a May 2014 military coup, the U.S. froze security and defense aid to Thailand and scaled back on annual military exercises, precipitating a diplomatic hiatus for the reason that junta had failed to honor Rule of Law, including holding a free and fair election. In 2015 the U.S. resumed diplomatic talks with Thailand. While the U.S. is Thailand’s oldest ally, the junta views China as a noncritical security partner vital to Thailand’s economy. China has seized this opportunity to cultivate political, economic and defense ties, including talks about building military facilities in Thailand to produce small arms, drones, and other security-related equipment. Bangkok is engaged in similar talks with Russia. Given its geographic location, the Trump administration must consider the negative impact of a failure to implement the TPP on U.S.-Thai relations and regional geopolitics. On July 20, 2016 U.S. Attorney General Loretta E. Lynch filed complaints seeking the forfeiture and recovery of more than $1 billion in assets associated with an international conspiracy by 1Malaysia Development Berhad (1MDB) to launder misappropriated funds. The 1MDB was created by the Malaysia government to promote economic development through global partnerships and foreign direct investment, ultimately improving the well-being of the Malaysian people. Instead, 1MDB officials allegedly misappropriated more than $3 billion. “The Department of Justice will not allow the American financial system to be used as a conduit for corruption. With this action, we are seeking to forfeit and recover funds that were intended to grow the Malaysian economy and support the Malaysian people,” stated said Attorney General Lynch. Malaysian Prime Minister Najib Razak is reputed to be the “Malaysian Official 1” referenced 36 times in the 136-page lawsuit and is believed to have personally received more than $1 billion of misappropriated funds. Mr. Najib has denied any wrongdoing or personal gain. The lawsuit, as well as the improbability of U.S. ratification of the TPP, has upturned U.S.-Malaysian foreign relations. China has seized this opportunity. Chinese investments into had Malaysia fallen by 30 percent in the first half of 2016. On November 1, 2016, Mr. Razak concluded a week-long visit to China with securing infrastructure investments in Malaysia of $32.2 billion, and by signing an agreement for SCS naval cooperation. 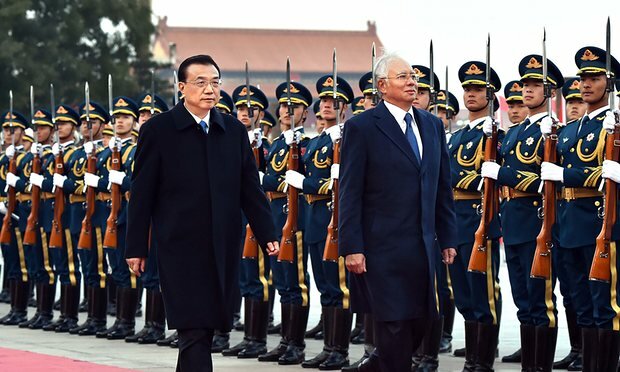 This is a reversal Mr. Najib’s previous position that Malaysia would not compromise its SCS claims, but hoped that it would be resolved through dialogue and peaceful negotiations; the position advocated by the U.S.
“Kuala Lumpur (has) sought direct engagement rather than confrontation with the Asian powerhouse over the South China Sea disputes,” observed Richard Javad Heydarian, Assistant Professor of International Politics at the Philippines’ De La Salle University. Director of National Intelligence James Clapper recently described the current international security environment as “the most complex and diverse array of global threats” he has faced in his 53 year career. Soft power, which includes virtually everything save military support, is a foreign policy tool which not only attracts other countries but gains their acquiescence on more important issues and reduces threats. With strategic precision, China has deployed soft power in Southeast Asia, gaining support for its dominance in the SCS dispute and diluting the influence of the U.S. and other foreign powers. “The revisionist powers in each region are cooperating with each other only superficially because they all see potential existential threats from each other,” confirmed Michael Green, Senior Vice President for Asia and Japan Chair, Center for Strategic and International Studies. The Trump administration must continue the Obama legacy of not only maintaining but strengthening U.S. relations in Southeast Asia. Mr. Trump must conceptualize the TPP as a necessary form of soft power. If the TPP is not ratified by the U.S., it will damage, or perhaps irreparably reverse, all of the work done thus far in the region. “If the U.S. is unable to back up its regional role … the regional states have no other choice but to accommodate Beijing,” said Thitinan Pongsudhirak, a political science professor at Bangkok’s Chulalongkorn University. If Mr. Trump’s administration fosters increased Southeast Asian dependence on China, then the U.S. risks its regional and global role as the only democratic superpower. This analysis is a part of series. The first analysis, “In Deep Waters with China and Russia” was published on June 13, 2016 and the second, “Justice, Security and Rule of Law: How the United Nations Security Council Has Failed You” on July 19, 2016. Green, Michael J., “Is the foundation of the U.S.-led order crumbling?”, November 15, 2016, Center for Strategic and International Studies. 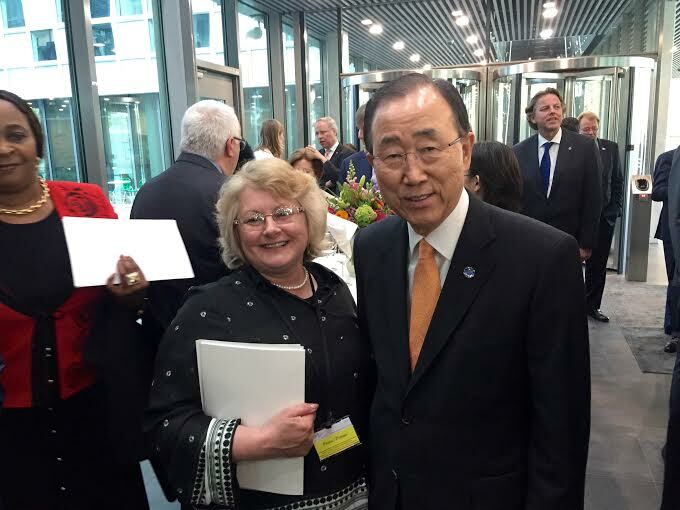 Lardner, Cynthia, “Justice, Security and Rule of Law: How the United Nations Security Council Has Failed You“, July 15, 2016. Lardner, Cynthia, “In Deep Waters with China and Russia“, June 10, 2016, and https://issuu.com/nafelosangeles/docs/e_magazine_june_2016_issue_draft_1_. “‘One Belt, One Road’ An Opportunity for the EU’s Security Strategy”, November 2015, Clingendael. “U.S. Seeks to Recover More Than $1 Billion Obtained from Corruption Involving Malaysian Sovereign Wealth Fund”, U.S. Department of Justice, July 20, 2016. The Transpacific Trade Partnership, Office of the U.S. Trade Partnership. Wen, Wang, and Xiaochen, Chen, “Who Supports China in the South China Sea and Why”, The Diplomat, July 26, 2016. Next post With crises set to worsen, what are aid groups’ priorities for 2017?